You can create folders to group your albums. 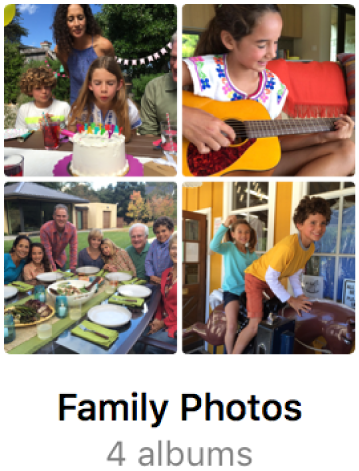 For example, you could create a folder named “Family Photos” and put all the albums of your family events into it. You can also create folders inside other folders. In the Photos app on your Mac, click My Albums in the sidebar. Drag albums into the folder. Tip: To quickly create a folder, Option-drag one or more albums onto another album. Photos places all the albums into a new folder. You can also drag other albums into the new folder. You can’t move shared albums into a folder. Control-click the folder, choose Delete Folder, then click Delete. The folder and the albums within it are removed from the library and from iCloud, but the items in the albums remain in your photo library. If you accidentally remove a folder, choose Edit > Undo Delete Folder to restore it. To remove an album from a folder, click the folder in the sidebar, then Control-click the album on the right and choose Move Album Out Of [folder name].